If you invite a guest to a private team, s/he can read all posts. To solve that issue, add below field to invite guests to a post only. The font size for a high resolution screen is quite small. Hope there is a way (even a workaround) to increase the font size. Click into a password safe and back again it clears the login form. Rather irritating. If I select gray, for example, for the Account, the titles of a private team are still blue. With multiple accounts, it would be nice to reflect the account that is currently selected. Ideally, it would also let you select the font color too. There are times that a Team needs the input of a specific person or set of people for a specific topic. It's not appropriate to bring that person in as a Team member, as they don't need to be involved with other things being discussed and shouldn't see the team's history. Right now a new team would have to be created, which splits the content outside of the main team. It also may be a short-lived team depending on the length of the conversation/discussion. Ad-hoc group chat likely would not be ideal, since the content would be split. 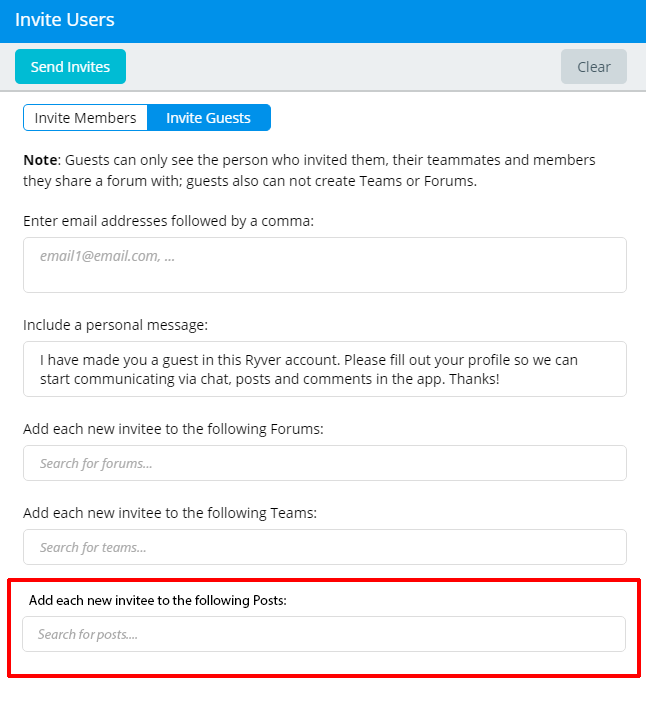 Please allow the ability to add a non team member to contribute on a specific Post in a team, when they are added to the Post by the post creator/admin/team admin. I think it could be nice to be able to choose to have your Ryver client execute a command when you get a notification/message. Primarily the reason for this is that I'm interested in making a notification that is more clearly visible. However a feature like this could be used for a lot of other tings as well, if you add the possibility of parameters like the ability to pass the message/sender/team to the command a lot of possibilities would open op for quick and simple integrations. Currently the Ryver desktop app shows that a spelling mistake has been made, but there's no way to easily fix it. In the browser (Chrome), I can right-click the word and it offers a way to correct the misspelled word with suggestions. 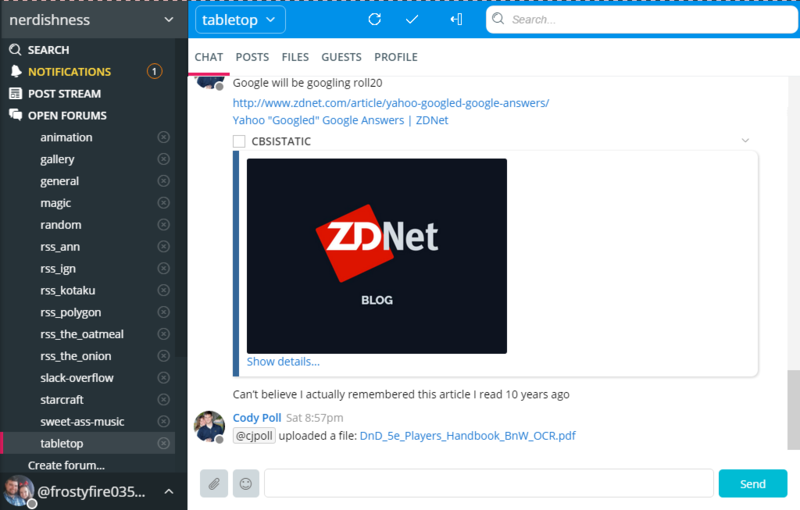 I would like to see that same functionality in the Ryver Desktlp app. The windows client won't start minimized even if I tell it to through the shortcut properties. Introduce the concept of a "personal" organization which becomes the user in other organizations. As an admin, I'd like to be able to view all direct messages. I would like to suggest moving the search bar, refresh icon, multi-select icon, and the online users toggle icon. It would seem to me better to have them in a convnetional place like many search bars are in the top right corner. It removes the trapped space around the "Chat" "Posts" bar, and it frees up some real estate for the actual chats themselves. This may be a Windows-only issue, but currently the desktop pop-up notifications for Ryver use the same blue circle with an 'i' in the middle symbol as general Windows notifications. This means that it's sometimes hard to tell out of the corner of one's eye if something is a Ryver pop-up or some kind of dull system notification. It would be great if it could be changed to a custom Ryver-only icon that's distinct enough from the Windows one to be easily distinguished.